The 34th America's Cup will be contested this fall in San Francisco Bay in high-speed, high-tech, hydrofoiling catamarans hitting speeds upwards of 40 kts (more than 46 miles per hour). These new AC72 class catamarans are 72 feet long (22 m), 46 feet wide (14 m) with a wing mast towering 131 feet (40 m) above the water. These boats weigh approximately 13,000 pounds, virtually all of it carbon fiber. Four America's Cup teams designed, built and are currently testing and tuning AC72s for the race series this summer, culminating in the America's Cup races in September. These boats presented exciting new engineering challenges to the designers for aerodynamics, hydrodynamics and structures. To meet these challenges, designers for Emirates Team New Zealand (ETNZ) relied on a wide range of computational tools, including Pointwise, as part of their aerodynamic and hydrodynamic design strategy. Since an entirely new class rule was introduced for the AC72, the design space for the new boats was very broad: everything from overall boat configuration and layout, optimum hull shapes, daggerboard and rudder configurations and wingsail geometry was new. While RANS CFD codes were used throughout the development program, potential flow panel methods were used for most of the early-stage design investigations to provide fast analysis turnover from CAD geometry. Labor was significantly reduced in the design cycle from geometry development to analysis because of Pointwise's capability to record Glyph scripts for repetitive meshing while consistently achieving high quality panelizations of hullform and appendage geometries. This also allowed many alternative hull shapes and appendage configurations to be quickly investigated. Figure 1: Emirates Team New Zealand Fully Foiling Downwind. Initial investigations of hull and appendage shapes led Team New Zealand to conclude that to win the America's Cup, it was critical to maximize the vertical lift carried by the appendages (daggerfoils and horizontal tails on the rudders), especially when sailing downwind. While speeds for monohull boats used in prior America's Cups were wave drag limited, this new class of AC72 catamarans was going to be speed limited largely by viscous drag, so minimizing wetted surface at high speeds was crucial. The ultimate limit of this design approach is a full foiling configuration in which both of the hulls are lifted clear of the water. 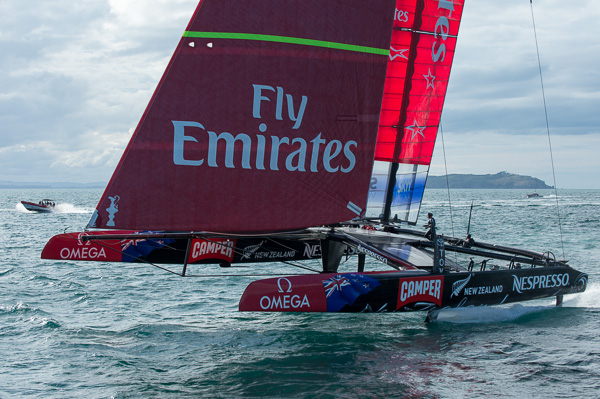 This foiling methodology for the AC72s was pioneered by ETNZ and has been adopted by the other teams. When the AC72 Class Catamaran rule was written, moveable elements such as trailing edge flaps on the daggerfoil and rudder appendages were excluded. This was intended to preclude hydrofoiling by removing the control elements traditionally utilized to achieve a stable, controllable flying mode operation. To achieve the goal of a fully foiling catamaran, ETNZ embarked on a program to develop a passively stable “controls-fixed” configuration that would “fly” stably without moveable control surfaces. This placed unusual additional force and moment stability requirements on the appendage configurations. To achieve the desired stability characteristics, a wide variety of appendage geometries were investigated, evolving from “C” shaped daggerfoils to “J” shaped foils with specially configured vertical and horizontal lifting areas. Rapid turnaround using Pointwise meshing for potential flow analysis led ETNZ to a series of appendage designs that were tested on smaller 10 m catamarans and, later, at full scale, on the AC72. 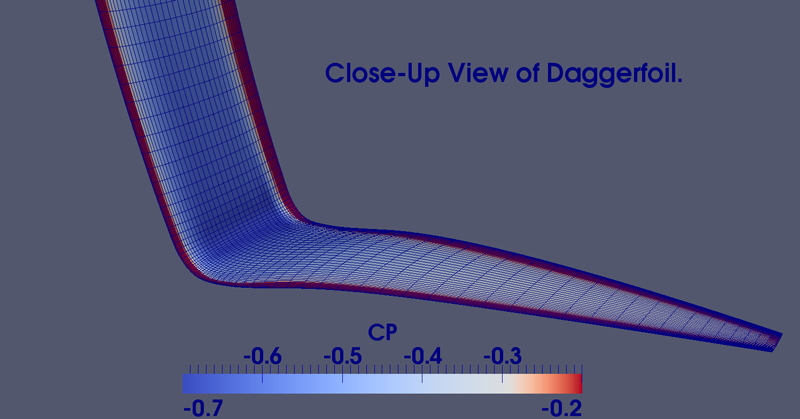 Figure 2: Close-up view of daggerfoil illustrating predicted surface pressures. Regions where Cp's were less than approximately 0.6 were susceptible to cavitation. Soon after pursuing the fully foiling option, it became apparent that these boats were going to be so fast downwind (40+ kts) that cavitation would be a serious design consideration on the appendages. Cavitation occurs when the pressure on the suction surface of the foils drops so low that water flashes to water vapor, creating gas cavities over low-pressure regions of the submerged foils. Cavitation can have a drastic effect on performance by reducing the lift generated by the foil and significantly increasing drag. Utilizing potential flow 2D and 3D design methods, ETNZ was able to optimize cavitation resistant airfoil sections that were tailored to work with the highly three-dimensional curved daggerfoil shapes required for ride control and stability. Once again the scripting capabilities in Pointwise resulted in a massive labor savings throughout the many iterations required to fine-tune the final appendage configurations. These candidate foils were thoroughly analyzed though a range of operating conditions using RANS codes to verify the potential flow predictions for forces and cavitation effects. Subsequent testing has further verified the analytical design work for the appendages. In the end, the races for the America's Cup will be decided by many factors beyond the technology itself, exotic as that may be. The crew, the training and the extensive preparation and testing will all play a strong part. The final races for the Cup will be held after the challenger is selected from the New Zealand, Prada (Italy) and Artemis (Sweden) teams in the Louis Vuitton Race Series in July and August. Finally, in September 2013, Oracle Team USA will be defending the Cup in a closely watched contest for these most highly developed, extreme sailboats. May the best team win! Scott Graham and Harold Youngren worked on aerodynamics and hydrodynamics as part of the design team for Emirates Team New Zealand AC72's. They have more than 60 years combined experience with a range of computational methods in the areas of design and performance prediction, including dynamic stability analysis, for surface ships, hydrofoils and partial hydrofoil supported craft, planing craft, underwater vehicles, yachts and aircraft design.